We’ve Kicked Off Some New Research, And We Need Your Help. An important part of Forrester’s research process is gathering input from financial services companies so that we can advise our clients on the latest trends in the market. We’re currently fielding a survey for vendors, end users, and experts that will provide the key input for a report on the current and future state of application architectures in financial services. 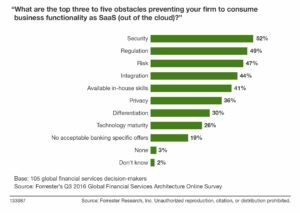 The previous survey showed, for example, that financial services firms were still reluctant to use SaaS-like delivery models for financial-services-specific software, for a variety of reasons. We believe the situation has changed, however — and we need your help to get a concrete grasp of today’s situation. If you are working for a financial services firm, you can find the survey link here.